During the last couple of months I’ve been learning the Meson build system. Since my personal interests in Open Source Software are around GLib and GStreamer, and they both have Meson and Autotools build systems in parallel, I’ve set as personal goal to list (and try to fix) blocker bugs preventing from switching them to Meson-only. Note that I’m neither GLib nor GStreamer maintainer, so it’s not my call whether or not they will drop Autotools. When generating a pc file for a library, it automatically take all dependencies and link_with values from that library and add them into the Libs.private and Requires.private fields. Extra dependencies (such as ‘threads’) can be added explicitly if needed. One common case is explicitly adding a public dependency that the generator would have added in private otherwise. Pretty easy one: gobject’s API documentation needs to pass an extra header file when compiling gtkdoc-scangobj from a non standard location. I made a patch to have include_directories argument to gnome.gtkdoc() method and use it in glib. Compared to Autotools’ configure, glib’s meson build system was missing many build options. Also existing options were not following the GNOME guideline. tl;dr: we want foo_bar instead of enable-foo-bar, and we want to avoid automatic options as much as possible. Now configure options are on par with Autotools, except for the missing –with-thread which has a patch pending on bug #784995. For GStreamer static builds are important. The number of shared libraries an Android application can link to is limited, and dlopen of plugins is forbidden on IOS (if I understood correctly). On those platforms GStreamer is built as one big shared library that statically link all its dependencies (e.g. glib). Autotools is capable of generating both static and shared libraries and compile C files only once. Doing so with Meson is possible but requires unnecessary extra work. I created a pull request that adds both_library() method to meson, and add a global project option that turns all library() calls to build both shared and static. This one is not directly related to Meson, but while working on static builds, I’ve noticed that GStreamer patched glib-networking to be able to static build them. Their patch never made it upstream and it has one big downside: it needs to be built twice for static and dynamic. GStreamer itself recently fixed their plugins ABI to be able to do a single compile and produce both shared and static libraries. The crux is you cannot have the same symbol defined in every plugin. Currently GIO modules must all define g_io_module_load/unload/query() symbols which would clash if you try to static link more than one GIO module. I wrote patches for gio and glib-networking to rename those symbols to be unique. The symbol name is derived from the shared module filename. For example when gio loads libgiognutls.so extension it will remove “libgio” prefix and “.so” suffix to get “gnutls” plugin name. Then lookup for g_io_gnutls_load/unload/query() symbols instead (and fallback to old names if not found). The second difficulty is GIO plugins uses G_DEFINE_DYNAMIC_TYPE which needs a GTypeModule to be able to create its GType. When those plugins are static linked we don’t have any GTypeModule object. I made a patch to allow passing NULL in that case to turn a G_DEFINE_DYNAMIC_TYPE into a static GType. Meson being python3-only and Cerbero python2-only, if we start building meson projects in cerbero it means we require installing both pythons too. It also adds problems with PYTHONPATH environment variable because it cannot differentiate between 2 and 3 (seriously why is there no PYTHONPATH3?). I ran 2to3 script against the whole cerbero codebase and then fixed a few remaining bugs manually. All in all it was pretty easy, the most difficult part is to actually test all build variants (linux, osx, windows, cross-android, cross-windows). it’s waiting for 1.14 to be released before merging this into master. Cerbero already had a recipe to build meson and ninja but they were broken. I made patches to fix that and also add the needed code to be able to build recipes using meson. It also makes use of meson directly to build gst-transcoder instead of the wrapper configure and makefile it ships. Later more recipes will be able to be converted to Meson (e.g. glib). Blocking on the python3 port of cerbero. One use case Olivier Crête described on Meson issue #2765 is he wants to make the smallest possible build of a GStreamer application, for IoT. That means static link everything into the executable (e.g. GStreamer, glib) but dynamic link on a few libraries provided by the platform (e.g. glibc, openssl). With Autotools he was doing that using .la files: Libraries built inside cerbero has a “.la” file, and libraries provided by the platform don’t. Autotools has a mode to static link the former and dynamic link the latter, meson don’t. I think the fundamental question in meson is what to do when a dependency can be provided by both a static and a shared library. Currently meson takes the decision for you and always use the shared library, unless you explicitly set static: true when you declare your dependency, with no project-wide switch. default_link: Tells whether we prefer static or shared when both are available. libraries. By default it has “/” which means all paths are allowed. It can be set to the path where cerbero built GStreamer (e.g. /home/…) and it will static link only them, using shared library from /usr/lib for libraries not built within cerbero. There is a long road ahead before getting meson build system on par with Autotools for GLib and GStreamer. But bugs and missing features are relatively easy to fix. Meson code base is easy and pleasant to hack, unlike m4 macros I’ve never understood in the past 10 years I’ve been writing Autotools projects. I think droping Autotools from GLib is a key milestone. If we can achieve that, it proves that all weird use-cases people has been relying on can be done with Meson. I’ve been working on this on my personal time and on Collabora’s “2h/week for personal projects” policy. I’ll continue working on that goal when possible. git-phab got tons of improvements last days, thanks to Thibault Saunier. It uses argcomplete for bash completion, but seems to work only if writing “git-phab <command>” and not “git phab <command>”. Ideas how to improve this? The “attach” command can now create a new task on phabricator when current branch is not associated to an existing one. The “attach” command now proposes to create a branch with a name in the form “TXXX-description” if current branch isn’t in that format yet. That makes easier to update the patchset later since the task will be guessed from the branch name if no –task argument is passed. It is now mandatory to have a “.arcconfig” file in your git repository with at least “phabricator.uri” and “project” keys. The “attach” command will use that info to set the project on new differential/tasks. The default commit range for “attach” and “log” commands is now from the head of the remote tracking branch to HEAD. Instead of being hard-coded to “origin/master..HEAD”. If your “.arcconfig” contains a “default-reviewers” key, it will be used when –reviewers argument is not specified. More ideas for future improvements has been filled in our backlog. Help and feedback is welcome. “git phab attach” now also push the branch and links it on the Maniphest (only supported on fdo and collabora’s phabricator atm). Reviewers/testers can then easily retrieve the branch with “git phab fetch Txxx”. Fixed compatibility with phabricator’s fragile commit msg parser. Recently I’ve been using Phabricator for a few projects. I wrote a small tool called git-phab to help attaching a set of patches to Phabricator for review. The idea is that it creates a new Differential for each commit in a range you provide, a bit like git-bz. It started as a small personal helper, but lots of colleagues said it’s useful for them as well, so let’s share it: repository, README. Made progress this weekend on OpenGlucose. The GUI is still ugly but it has the info I want. Handling the units. My only device is mg/dl but other countries uses mmol/L. Since I’m living in Canada where they use mmol/L I should grab a new device with those units, so I’ll be able to compare logs and see how to know in which unit the device is configured. Make printable report, I’ve heard doctors like that. OTOH, I shouldn’t encourage using unofficial app for medical purpose. Support other FreeStyle devices. I’m pretty sure they all have the same kind of format so most of the parser should be reusable, I hope. I should be able to get a spare FreeStyle Freedom Lite in a few weeks. Publish an ubuntu package on a PPA. I’m curious, does someone else own an InsuLinx and tried OpenGlucose yet? Or even tried to support another device? 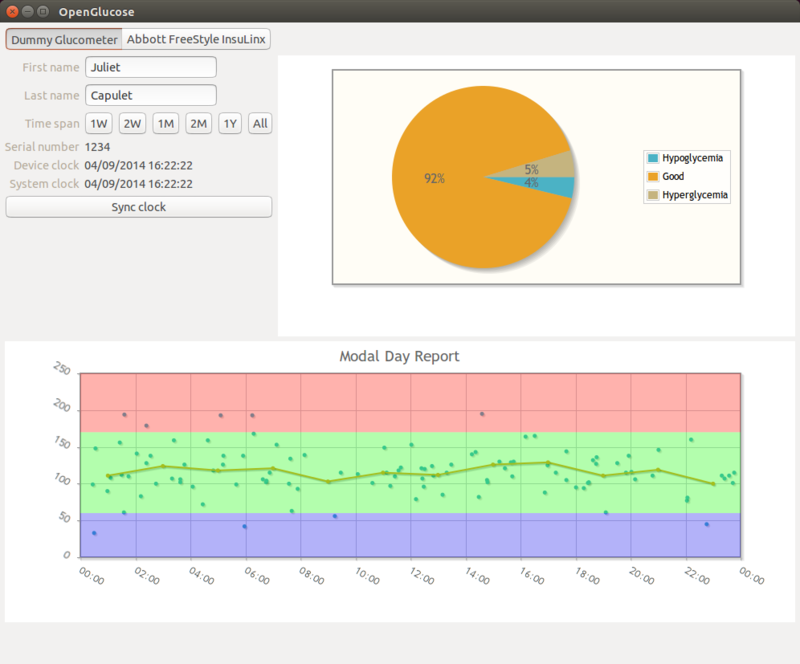 It is made using a GtkApplicationWindow containing a WebkitWebView, the content is made with HTML/CSS/JS with jquery and the chart is made using jqplot. To make testing easier, I also added a dummy device that has random data, it can be enabled by setting OPENGLUCOSE_DUMMY_DEVICE=1 in your env. A lot more work is needed, but that’s a start. I recently got diagnosed with a diabetes type 1. 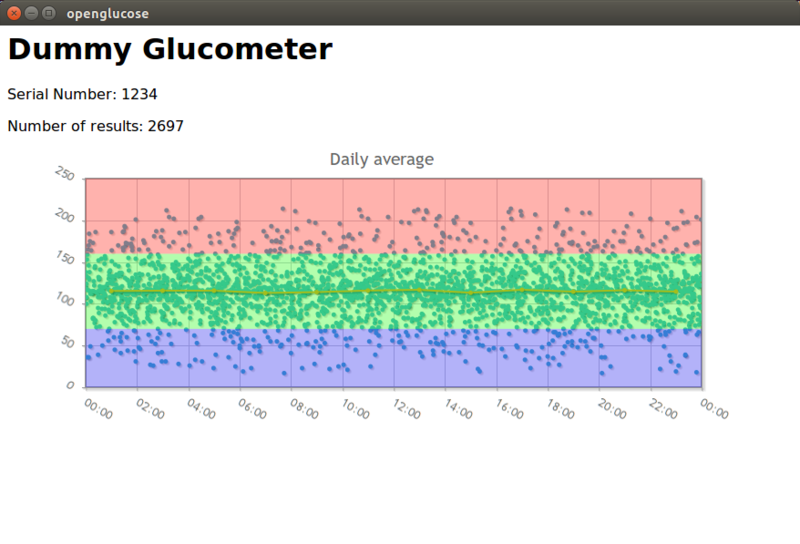 Like all diabetics, I got a glucometer device that comes with a windows/mac closed-source application. That’s clearly not acceptable for a freedom lover! So here is my new challenge: reverse-engineer the USB protocol of my Abbott FreeStyle InsuLinx device, and write an open source Linux application for it. So far it only fetch the bare minimum information from the device and print them in the terminal. More GUI/features will come later. If you’re a geek diabetic, your help is welcome! It was a really popular Empathy feature request, it even has a bounty on it, and today I just did it! The patches are available in bugzilla, apply on telepathy-gabble and empathy master. I hacked it on my free time, let’s see if crowd funded projects really works. If you like that feature feel free to make a donation on the bounty: https://freedomsponsors.org/core/issue/333/telepathy-should-support-otr-encryption. I am working on Folks2 when I have a bit of free time. In short it is a rewrite from scratch of Folks in C with a daemon/db to remember who is merged with who. The goal is to be faster and being able to load individuals separately instead of having to load them all. Recently, I’ve been writing libfolks2-roster, a GTK library providing widgets to display a contact list and contact details. It is using awesome GTK 3.10 GtkListBox, GtkStack and GtkSearchBar. The main issue I’m facing now is GtkListBox slowness, it really needs a model to create only visible widgets.